After my initial attempts at creating alchemical flexagons (in week 24), I decided to create a hard backed version. This would not only give the object greater longevity, but would also allow audiences to manipulate it much more easily. Having realised that the flexibility of the structure was completely dependant on the hinge, this would therefore potentially allow me to create structures out of any material providing that the hinge flexed fully both ways. My first attempts at producing a more sturdy version were reliant on understanding how I might attach the structure together. Creating the paper version had made this much easier as the paper could be folded and fastened together in such a way as to hide the join. I also realised that I would have to fold the card flexagon before securing it, which was slightly tricky, but I finally managed it. The process of creating a larger hinge to aIlow for the thickness of the card also highlighted how the space between each of the pages allowed them to turn much more fluidly, an effect which I might be able to apply to any further paper versions. I now had a working prototype. The next stage was to consider how I might cover these hard flexagons. As the content on the paper versions had been produced through printing on the paper before folding it, I realised that I would have to reconsider how I might include any potential content on the hard version. Firstly however, I needed to work out the template for the covering material. After a few failed attempts, I managed to create a covered version, using a bookbinding paper known as linson. Linson is a strong type of paper which is treated to resemble cloth. It is often used in book covering and creates a hardwearing finish with the qualities of an old hard backed book casing, which was exactly the kind of aesthetic I’d hoped for. However, I still had the problem of how I might transfer images and / or text onto this object. After considering the potential of letraset, screen printing or digital copy, I decided to try out foil blocking, a technique that I’d recently been introduced to through my bookbinding class. Foil blocking uses a typesetting process similar to letterpress but instead of using the type to transfer ink, the letters are heated and then pressed into foil on the surface of the book. I set my type to print all the text on each side at once , but as my prototype had already been folded, the card created raised levels in different areas of the book, meaning that only two words at a time could be printed. I decided not to let this deter me and instead folded the flexagon out bit by bit so that eventually all of the sections had words printed on them. I’d originally set my type so that all of the text was running the same way, but working within the constraints of my object under the foil blocking press meant that the text now ran in a square, which I found more aesthetically interesting and seemed to echo the cyclical nature of the work. Although the foil blocking produces interesting and aesthetically pleasing results, unfortunately it is limited to the brass type that is available. Therefore, I want to consider the potential for printing on covering material first, using either digital or screen print. There is also the option to use relief printing such as lino or collograph after assembling the work, although this has more potential for error. I’m also interested in the possibility of creating flexagons using wood and metal hinges, although I haven’t found a suitable hinge that could allow this as yet. The use of more robust materials would also allow the potential to upscale the work to make game-style boards and large sculptural works. Although this seems to be moving further away from artist books, it is predicated on the work of artists such as Anselm Kiefer, whose large lead books became ‘immovable fixtures in the museums and galleries that owned them’. Although the focus of my work is artists’ books, and I have been creating and exhibiting this type of work since 2007, I’ve never really done any formal training in bookbinding. 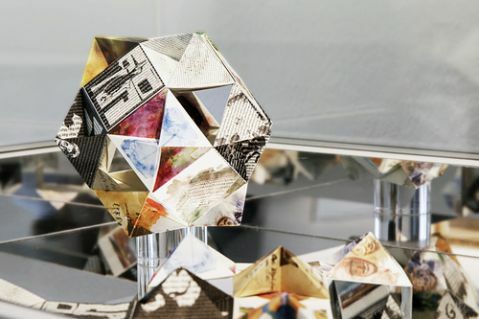 Artists books and book objects, although akin to traditional bound codices, tend towards expressing the idea of a book and the concepts, materials and format implicit within those ideas. Therefore, I had not felt the need to explore more traditional methods of binding. However, I did have a general understanding of the kinds of techniques and materials involved, having learnt through books and one-off workshops, so I decided to take a traditional bookbinding course in order to consolidate my previous knowledge and to see if there was more that I could utilise within my practice. There were two courses available; Bookbinding 1 & 2, and although I felt as if the first level might be too easy for me, I decided to take it anyway so I could make sure I’d accessed all of the available information. As it turned out, there was still a lot for me to learn. We created single and multiple section bindings, and although I was familiar with most of the sewing techniques involved, it was useful to confirm that my knowledge was correct by an experienced industry bookbinder. We covered a number of techniques including pamphlet stitch (a simple sewing technique used to create single section bindings or to attach sections to a concertina spine), French sewn, and coptic. We also learned how to determine grain direction, which is something that I’ve always been aware of but never paid much attention to before. However, the thing that was most interesting about these sessions was learning about the different book coverings and casings. There are three main styles of binding on a traditional Western codex: quarter bound, half bound, and full bound. The quarter bound book is bound in two different types of material – one on the spine and part of the sides, and another (less expensive) one on the remainder of the sides. The half bound book is bound in a similar way, although this time, the corners are also covered in the same material used for the spine. The full bound, as the name might suggest, is where the book is covered in only one piece of material, such as leather. These different styles can also be finished in three different ways: cut flush, cut flush turned in, and squares. Cut flush indicates that the book is assembled with boards and covering materials before it is trimmed. This means that the covers are the same size as the text block and the board material can be seen at the sides of the covers. Cut flush turned in, on the other hand, is where the boards are fastened loosely to the text block and trimmed to size, before being covered in material which is then folded over the edges of the boards. Squares is the most expensive finishing technique, and means that the text block has been trimmed to size before the boards are attached. The boards are then cut slightly bigger to protrude over the edges of the text block. Whenever I make artist books I always try to use basic materials that will be available to me outside of a specialist workshop environment. However, I was still keen to learn more about the different types of equipment available, and how I could add to the tools currently at my disposal. Equipment included the different types of presses, such as the nipping and lying press, sewing frame, bone folder, awl and cobblers knives, to name a few. Although all of the equipment is useful when producing traditional fine binding work, I felt that most of the larger equipment wouldn’t be essential in producing my small edition artists’ books. However, after using the foil blocking press, I realised that certain tools would be quite useful and I resolved to find these facilities at university. My previous research into artists creating and deconstructing museums (in week 53) has led me to consider the ways in which artists have intervened in museums, either through being commissioned to respond to the collection, creating interpretive works, or sometimes even uninvited. Since the 1990s, explorations of the museum structure within artist practice have developed exponentially, so much so that museums regularly invite artists into their institutions in order to create interventions within the space or with the objects. However, it is not just art museums that are interested in working with contemporary artists. Ethnographic and psychoanalytic museums including the Pitt Rivers Museum, Oxford or the Freud Museum, London, also commission artists to respond to their collections. These projects are not as much about creating new objects as developing artistic practice around already existing ones, thereby allowing audiences to gain a better understanding of both the nature of contemporary art practice as well as how museum culture affects the way that they interpret the past. The Museum as Muse: Artists Reflect by Kynaston McShine, Museum of Modern Art, New York & Thames and Hudson, London, 1999. Sculpture and the Museum by Christopher R Marshall (ed), Ashgate, Surrey Uk & Burlington, USA, 2011. So far I’ve been contextualising my interests in cultural traditions and the artwork that I’m producing in relation to the historical and contemporary art production. However, it is also necessary for me to understand how this relates to theories developed within art history proper. 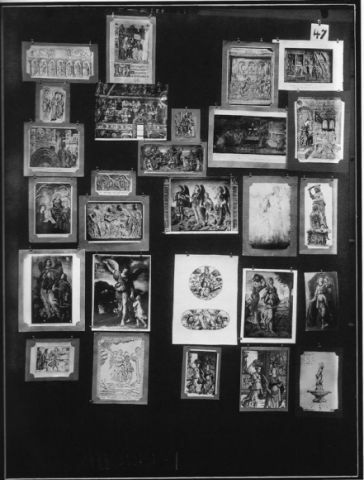 In particular, parallels can be drawn between these ideas and the work of Aby Warburg. His practice of collating and understanding a global iconology were also continued in part by his students, Erwin Panofsky and Ernst Gombrich. As part of his Kulturwissenschaft project, Warburg amassed a library of around 60,000 volumes, which was later to become the Warburg Institute, a research institute affiliated with the University of London. Included within this collection was the Mnemosyne Atlas, a rich repository of around 1000 images, which were organised and pinned to 40 large panels and then photographed. It was from this that he constructed his ideas of the ‘Iconology of the Interval’, or the spaces and connections between the images that subsequently create meaning. Unfortunately, the original panels were lost fleeing Nazi Germany, but the ‘Atlas’ still exists in the form of 79 photographic plates in the archives of the Warburg Institute. This lifelong project was developed in response to the question “Was bedeutet das nachleben der Antike?”, roughly translated as “How are we to interpret the continued revivals of elements of ancient culture in Western civilisation?”. (Woodfield, p55, 2001) This question was underpinned by Warburg’s studies of mimesis and allegory; ideas which were realised in the form of his writings on astrological signs as reflecting both a primitive mimeticism and also a scientific objectivism. Warburg’s studies not only foreground the potential for ideas of the development of a global history of art though the study of folklore and tradition, but also reflect affinities with the work of Walter Benjamin in his studies of mimesis and allegory, thereby connecting to my previous research (in week 36). His production of an archive of images which has in turn become a cultural artefact, also reflects allegorical sensibilities and the reproductive function of the archive. On the 6th and 7th of November 2013, the Henry Moore Institute in Leeds staged a conference entitled ‘Imaginary Exhibitions’. Considering my recent thoughts about objects and their relationships to museum contexts, the conference abstract seemed to address some of the questions about the politics of display and the structural nature of devising and curating exhibitions. The papers ranged from methods of depicting the invisible (in Robert Barry’s ‘Inert Gas Series’) through to transcribing the exhibition into a publication or online space, creating unrealisable connections in scale and location (as with Circle magazine and Le Musée Imaginaire), or plans to transgress the gallery walls in order to reintegrate art back into society. In fact, many of the ‘imaginary’ proposals suggested a utopian ideal to create spaces of engagement, rather than the contemplation of objects. Unfortunately, the scale and logistics of these plans led to many of them being unrealised. Take, for example, the case of Giacometti. His public art proposal ‘Projet por une place’ aimed to consider how spaces might be constructed and designed in relation to and in conjunction with objects. However, this proposal was not realised and only made it to the maquette stage which currently exists as a small wooden object within the Guggenheim collection in Venice. Other projects included Tania Doropoulos’ discussion of the failure of the ‘1959 Situationist International Dynamic Labyrinth at the Stedelijk Museum’, whereby extensive plans were drawn up for a labyrinth to be built within the gallery walls with a simultaneous three day dérive to take place across Amsterdam. The paper I found most interesting however, was ‘Nothing to Show for It: Art and Technology in the age of de-materialization’. Presented by Dawna Schuld of Indiana University, the paper discussed the successes and failures of the Art and Technology programme and subsequent exhibition at the Los Angeles County Museum of Art (LACMA). Despite emerging as part of a corporate agenda, the use of technology to explore the dematerialisation of the art object, systems aesthetics, and aeronautic experiments, seemed to place the experience (as opposed to the object) back at the centre of the art making. However, the programme was fraught with difficulties. Originally, 78 artists were selected to take part in the initial programme to develop new technological proposals. However according to the report, by the time of the exhibition three years later, only 14 had produced exhibition-worthy pieces. In addition certain experiments, such as the anechoic chamber or the Ganzfeld installation, intended to challenge and distort perceptions of the audiences, but were criticised as a kind of fascist game which exerted unnecessary control over audiences. All in all, the conference was a good grounding in ideas about the ways in which artists and curators can work with existing structures to produce a work that exists as something other than a kind of museum reliquary. Although the papers tended to focus on the ‘invisible’ rather than the ‘imaginary per se, it created an interesting framework for further discussion. Furthermore, the introduction to the work of Andre Malraux through ‘Le musee Imaginaire’ has enabled me to develop a new brief for a curatorial project at the start of next year.